Bryn Keenor, the son of Fred Keenor, captain of Cardiff City’s 1927 FA Cup Final winning team, has passed away. His daughter, Veronica, contacted the Trust last night with the news. Bryn was 90. 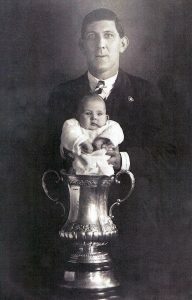 As a baby he was famously pictured in the FA Cup trophy, held by his father. Bryn was the last surviving child of the legendary Bluebirds skipper. Trust chair Keith Morgan said: “The Trust wishes to express its condolences to Bryn’s family and friends at this very difficult time. In November it will be the sixth anniversary of the Fred Keenor statue being unveiled at the Cardiff City Stadium. The Trust led the appeal to raise the funds for the statue, supported by fans and organisations.